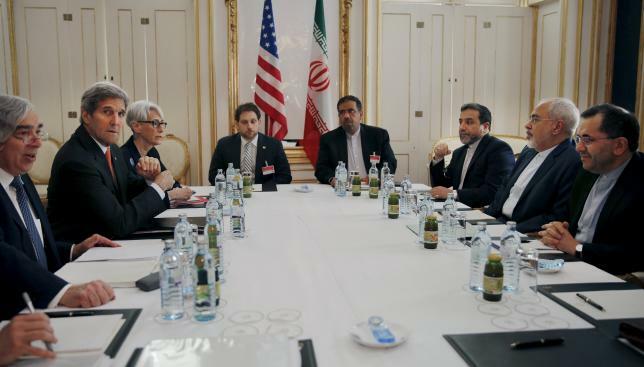 VIENNA – Iran is backtracking from an interim nuclear agreement with world powers three months ago, Western officials suggested on Sunday, as US and Iranian officials said talks on a final accord would likely run past a June 30 deadline. Securing an historic agreement would end a more than 12-year nuclear standoff between Iran and the West and open the door to suspending sanctions that have crippled Tehran’s economy. It could also help ease the diplomatic isolation for an Iran that has become increasingly assertive across the region. Highlighting how much work remains in the nuclear negotiations, British Foreign Minister Philip Hammond said on arrival in Vienna that major challenges remained, including on the parameters already agreed in April in Lausanne, Switzerland. Other Western officials echoed Hammond’s remarks, saying some of the backtracking involved the mechanics of monitoring Iranian compliance with proposed limits on nuclear activities. “It feels like we haven’t advanced on the technical issues and even gone back on some,” a Western diplomat said on condition of anonymity. Another Western official traced the apparent backtracking to a speech by Iranian Supreme Leader Ayatollah Ali Khamenei last week, in which he ruled out freezing sensitive nuclear work in the country for a long time. “His speech last week seems aimed at constraining (Iranian negotiators’) flexibility in the last stretch of the talks, as he has done at a number of key intervals over the last two years,” a Western diplomat told Reuters, citing an internal government intelligence assessment of Khamenei’s speech. US and European negotiators also want to ensure there is a mechanism for restoring sanctions if Tehran fails to meet its commitments under any future accord. Germany’s foreign minister told reporters that Iran had promised to stick to the commitments it made in April. “We were told that Iran stands by the (Lausanne) parameters and that’s what we will of course measure the Iranian side against,” Frank-Walter Steinmeier told reporters. Iranian nuclear chief Ali Akbar Salehi said Iran was committed to the Lausanne agreement. “If the other party also remains committed to the Lausanne agreement and avoids having excessive demands, a final deal is within reach,” Iran’s Tasnim news agency quoted Salehi as saying on Sunday. anonymity, said Washington was not bothered by Zarif’s plan to return to Tehran overnight, saying it was always expected that ministers would come and go from Vienna as the talks heated up. “Zarif told the Secretary (of State John Kerry) yesterday that he would be returning to Iran for a very short visit,” a senior US official said. Iranian media said Zarif would return on Monday. An Iranian official told Reuters that Zarif would “consult with the leadership” over the talks in Vienna. French Foreign Minister Laurent Fabius, who arrived in Vienna on Saturday, left for New York on Sunday and was expected to return soon. Kerry and Zarif have met repeatedly over the last two days. Kerry also met on Sunday with the foreign ministers of France, Germany, Britain in Vienna, along with European Union foreign policy chief Federica Mogherini. Deputy ministers from Russia and China also joined. Zarif was also holding bilateral meetings with other members of the six-nation group. The United States, Israel and some Western nations fear that Iran has been trying to develop a nuclear weapons capability, but Tehran says its programme is for peaceful purposes only. China’s Vice Foreign Minister Li Baodong was more upbeat about the state of the negotiations, saying that Iran and the six were “only steps away from the finish line of the marathon of Iran nuclear talks.” However, he added that there were still “a number of very hard issues” to be resolved. Speaking after a cabinet meeting in Jerusalem, Israeli Prime Minister Benjamin Netanyahu, one of the biggest critics of the US policy of engaging with Iran, said too many concessions were being made to Tehran.